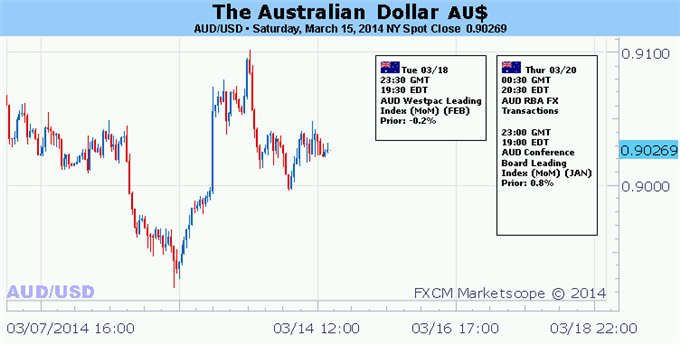 What will move the US dollar in the week ahead? We are awash in major fundamental catalysts – the type that can generate meaningful trends and not just short-lived bouts of volatility. With benchmark risks measures like the S&P 500, Emerging Markets and yen crosses retreating this past week, the immediate focus moving forward will be the health of global investor sentiment. And, through that day-to-day anxiety, we will also have the next FOMC rate decision complete with updated forecasts and Chairwoman Janet Yellen’s first press conference since taking the helm at the central bank. In the known – and vague – event risk ahead, there is a clear bias for market impact that benefits the greenback. A surprise for example on the risk front would be a sentiment collapse – a substantial boost for a safe haven like the dollar. Status quo, on the other hand, is something the benchmark currency has theoretically adapted to in its relatively steady performance as of late. From a trading perspective, that translates into a far greater risk of volatility and momentum behind a dollar rally than a tumble. That being said, we have still seen the Dow Jones FXCM Dollar Index (ticker = USDollar) decline in five of the past six weeks. A story that has gained considerable traction - though lacking for confirmation – is a move by certain major economic players to diversify away from concentrated US (Treasury and dollar) exposures. This past Friday, it was reported that securities held in custody for foreign accounts plunged more than $100 billion – the biggest drop on record. Many speculate this could have been a move by Russia in response to the Crimea situation. This dramatic move aside, the diversification move has been a slow development for some time. The monthly international capital flows account (TIC) has shown net outflow from the US in eight of the last 12 months. And, China has been a big part of this move, with a supposed appetite for Eurozone exposure – hence the EURUSD’s ability to grind out steady gains. The most effective way to halt this diversification in the near-term is for a bolt of fear to rip through the global financial markets. Though the effort to spread exposure is itself a move to reduce risk, a true deleveraging of mature speculative positions and scramble for liquidity would send investors to the dollar. Whether an unwind from emerging markets and Eurozone periphery or evasion of a credit market squeeze, the dollar is a beacon through panic. The spark that can effectively incite fear is therefore our primary concern. We have already seen evidence these past weeks that the markets are on edge and sensitive to bigger flights to safety. Headlines that contribute to China’s slowing economy or lending market troubles, a moral hazard seizure due to a universal lean away from stimulus, or recognition of leveraged risk could effectively jump start a watershed change in positioning. Yet, these have been issues for some time. More isolated and perhaps destabilizing may be another emerging market shock. Following the India-based risk move last year and Turkey concerns in late January, the concern now is the standoff between Russia and the Western world over the Crimea region of Ukraine. With a referendum vote - on whether to join Russia – due over the weekend, this is certainly a hot spot for ‘risk’ trends. Gold rallied for a sixth consecutive week with the precious metal advancing 2.8% to trade at $1378 ahead of the New York close on Friday. A breach above the monthly opening range this week and continued concerns over the geopolitical unrest in Ukraine has kept prices well supported as broader risk assets came under pressure. With gold trading at levels not seen in six month, the stakes are high for the bulls heading into next week. US equity indices were off by more than 2% on the week and the flows have continues to prop up classic haven plays like the Japanese yen (top performer on the week) and the Swiss franc. The event risk posed by the ongoing standoff in Crimea was just the catalyst needed to push gold prices through resistance and while the broader picture remains constructive, prices are at risk in the near-term. Looking into next week traders will be closely following developments in Crimea with a referendum votescheduled for Sunday ahead of the FOMC policy decision on Wednesday where the central bank is widely expected to taper QE purchases by another $10 billion. Look for guidance from the accompanying policy statement with any mentions about the improving jobs outlook and/or inflation likely to limit further advances in gold in the near-term. That said, the focus remains on validation of recent resistance breach with pullbacks likely to offer more favorable long entries. From a technical standpoint the breach above the March opening range saw prices go through trendline resistance dating back to the 2012 high. We have continued to trade within the confines of a well-defined ascending channel formation with resistance seen capping the advance just higher. Note that the last time gold has rallied for this many consecutive weeks was back in 2011 when prices went on a seven week streak. That rally preceded a huge surge in volatility with gold posting record all-time highs just three weeks later before turning sharply lower. Bottom line: look for a blow-off next week to offer a pullback in gold with our broader focus remaining weighted to the topside while above the March low at $1325. We will take a neutral stance heading into next week’s event risk while noting topside objectives at $1400, $1415 and the August highs at $1433. The Japanese Yen rallied sharply versus the US Dollar and other major counterparts as the highly-correlated Nikkei 225 posted its worst weekly performance in 9 months. A drop in FX volatility prices nonetheless suggests the JPY could pull back in the week ahead. A mostly empty Japanese economic calendar will shift attention to the upcoming US Federal Open Market Committee (FOMC) policy meeting. Yet few expect the Fed to announce any changes to the pace of its “Taper”, and we view any FOMC-driven volatility as relatively unlikely. It’s perhaps unsurprising to note that forex options markets have pushed USDJPY volatility expectations near their lowest levels in nearly seven years. One major wildcard is the highly-anticipated referendum in Crimea, the contested Ukrainian region which has forced a chasm between the West and Russia and threatens to destabilize East/West relations. It’s important as traders not to get lost in the minutia of political developments around the world; it’s often maddening and counterproductive. But if citizens of Crimea vote to secede from Ukraine and rejoin Russia, the United States and European Union may follow through on threats of significant economic sanctions against Russia. Such an event would likely generate significant financial market volatility and an important flight to safety. In such an instance the Japanese Yen would almost certainly rally against major counterparts. Beyond that, traders will watch developments in the Japanese Nikkei 225 and look for any surprises out of late-week commentary from Bank of Japan Governor Kuroda. If the Yen continues higher we can arguably expect Kuroda to react and comment on exchange rate movements. Yet recent BoJ rhetoric suggests that the central banker sees relatively little scope for expanded monetary policy easing. Thus there is little reason to expect significant moves out of the Japanese Yen absent a substantive turn lower in ‘risk’ markets. The yen is the winner of a turbulent trading week which saw new highs for the euro and the kiwi. The first rate decision by Janet Yellen is the main event. Among other highlights are the German Economic Sentiment, speeches by heads of central banks, UK employment data, as well as US employment and housing data. These are the main market movers on Forex calendar. Here is an outlook on the influential events for the coming week. German ZEW Economic Sentiment: Tuesday, 10:00. German economic climate dropped more than expected in February, reaching 55.7 from 61.7 in the previous month, thanks to emerging market concerns. This release marked the second consecutive fall; economists expected a small decline to 61.3. Nevertheless, analysts expect Germany to continue its growth trend this year leading its Eurozone members to recovery. German economic climate is forecasted to decline further to 52.3. US Building Permits: Tuesday, 12:30. Building permits plunged in January to 937,000, falling 5.4% from December. The release was considerably weaker than the 980,000 expected by analysts. The unusually cold weather and snow storms stopped growth in the housing sector. On an annual basis, starts fell 2.0% from January 2013, to 898,000, the lowest level since August 2011, while building permits, were up 2.4% from a year ago. A stronger reading of 970,000 is expected this time. US inflation data: Tuesday, 12:30. U.S. consumer prices increased in January, thanks to a rise in demand for electricity and heating fuel, caused by the cold winter. Consumer Price Index climbed 0.1%, following a 0.3% in December. In the 12 months to January, consumer prices edged up 1.6% after increasing 1.5% in December. Meanwhile, core CPI, excluding volatile energy and food components, also rose 0.1% for a second consecutive month. In the 12 months to January, core CPI rose 1.6%, following a 1.7% increase in December. Both CPI and core CPI are expected to gain 0.1%. UK employment data: Wednesday, 9:30. The British unemployment rate unexpectedly climbed in the fourth quarter, reaching 7.2% from 7.1% in the third quarter a fact that compelled the BOE to keep interest rates unchanged. Meantime, jobless claims fell 27,600 in January, beating economists forecast of 18,300. However the pace of decline will moderate in the coming months due to a certain decline in economic activity. For as long as unemployment remains above the 7% threshold, monetary policy will not be changed. Jobless claims are expected to decline by 23,300 while unemployment rate is expected to remain unchanged at 7.2%. Fed decision: Wednesday, 18:00, press conference at 18:30. The taper train is on track and the Fed is very likely to reduce its bond buys by another $10 billion. After the Fed prepared markets for the tapering during a long period of time, only a major disaster could change the course. The recent OK NFP left little doubts. In addition, the composition of the FOMC is more hawkish, and Yellen would need to prove she is tough enough. It is her first decision and being a woman probably also plays a role. In the press conference, she is expected to show continuity, following in the footsteps of Bernanke, and in line with her recent lengthy testimonies in Washington. The move is largely priced in, and a strengthening of the dollar in the aftermath of the decision could be quite limited. US Unemployment Claims: Thursday, 12:30. The number of new claims for unemployment benefits unexpectedly dropped 9,000 last week to a seasonally adjusted 315,000.This was the best reading since November. Economists expected a rise in claims to a level of 334,000. The four-week average fell 6,250 to 330,500, the lowest since early December. Improved weather conditions have contributed to the improvement in the job data. The number of people still receiving benefits after an initial week of aid fell 48,000 to 2.86 million in the week ended March 1. That was the lowest level since December. A small rise to 327,000 is forecasted. US Existing Home Sales: Thursday, 14:00. U.S. existing home sales dropped more than expected in January, reaching an 18 month-low of 4.62 million unit’s annual rate following 4.87 million in the previous month. The cold weather and house shortage were behind this decline. Economists projected a higher figure of 4.73 million. A rise to 4.65 million is predicted now. US Philly Fed Manufacturing Index: Thursday, 14:00. Factory activity in the U.S. mid-Atlantic region contracted in February reaching -6.3 after posting 9.4 in January, amid a fall in new orders. Analysts expected a high reading of 9.2. New orders plunged to -5.2 from 5.1 increase and the employment component contracted to 4.8 from 10.0. However, economists believe manufacturing will pick-up in the coming months. Factory activity is expected to increase to 4.2. ECB’s Draghi Warns on Euro Strength – Will it Keep Rising? 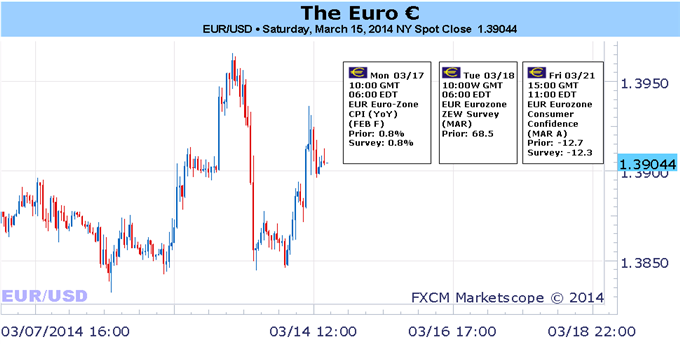 - The Euro melt-up was in full swing this week until ECB President Draghi spoke on Thursday. It was a week for the Euro to digest its recent gains after the European Central Bank rate decision on March 6, and the Euro’s performance by Friday reflected a neutral yet volatile resolution to the past five days. Amid a rather absent economic calendar, the most significant event to dislodge the Euro from its resiliency was a batch of commentary from ECB President Mario Draghi on Thursday. The concern President Draghi expressed was that the Euro was becoming, in plain language, too strong, and its impact was reverberating in several ways. Competitiveness in the region – mainly the periphery nations – was suffering as a result of the recently elevated exchange rate. We’ve previously expressed that this is a shallow argument in light of recent growth data. In support of the ‘stronger Euro reflects confidence in the region’ argument, consider that on an equal-weighted basis versus the Australian Dollar, the British Pound, the Japanese Yen, and the US Dollar, the Euro gained +1.12% in the 3Q when GDP was -0.3% y/y; growth accelerated in the 4Q to +0.5% y/y when the Euro basket gained +4.01%. It’s difficult for anyone to suggest that the Euro represents a constraint to growth from this perspective; the higher Euro is a result of capital returning to the region. The Euro-Zone Current Account (BOP) surplus expanded to €33.2B in December, its largest surplus ever, up from €27.2B in November. This is notable because the Current Account reflects all transactions (ex financial) including trade in goods, services, income and current transfers between a country’s/region’s residents and non-residents. The higher Current Account thus reflects capital flows coming into the Euro-Zone, and not out of it; this is a natural upside pressure supporting the Euro. While the Current Account surplus reflects a low level of imports and only modest export growth, the weak Euro-Zone consumer is evidently afflicted and not the cause of the Euro’s resiliency. The fact that President Draghi said that the argument was evidently focused on inflation being “too low” rather than “too high” isn’t surprising: we’ve heard comments about low inflation and how it’s been a concern for months. The volatile components of the Consumer Price Index (food, alcohol, tobacco, and energy) that tend to eat into disposable income are a net-negative weight: the headline CPI is +0.8% y/y; the Core CPI is +1.0% y/y. The higher Euro is helping keep the non-Core costs constrained which helps fiscal policymakers; but considering that consumption overall remains low in a tepid jobs environment, inflation for the sake of inflation (reflected by the non-Core inputs) could do more harm than good: in an era of deleveraging, consumers will be forced to forego spending elsewhere if non-Core inputs rise, weighing further on growth. For now, President Draghi’s warning is just that: a warning. We’ve previously demonstrated that the bar is high for the ECB to entertain non-standard easing measures, and if the “line in the sand” for the EURUSD exchange rate was $1.4000 before it was considered “too strong,” than the ECB wouldn’t start trying to knock back the EURUSD now – that would have occurred closer to $1.3500 to try and prevent a test of $1.4000 altogether. Instead, we think that this commentary from President Draghi is merely the first warning, meaning the threshold for action is higher ($1.4500?). Barring a return of crisis conditions, the most palatable outcome for the ECB at present time is a BoE-styled Funding for Lending Scheme (FLS) targeted at boosting credit growth to small- and medium-sized enterprises (SMEs). A timid economic calendar on the domestic front is set to put external forces at the forefront for the Australian Dollar in the week ahead. The spotlight is the March FOMC monetary policy meeting, this time to be accompanied by an updated set of official economic projections from the Federal Reserve and Janet Yellen’s first outing at the Chairman press conference. Straight-forward fundamentals may be undermined by the presence of geopolitical risk however which may set off sporadic bouts of risk aversion and undermine follow-through. The markets have grappled with a difficult conundrum since mid-January: on one hand, US economic news-flow increasingly underperformed relative to consensus forecasts; on the other, the Federal Reserve remained steadfastly committed to “tapering” its QE stimulus effort. Central bank officials have argued that the soft patch in US performance looked to be transitory and did not offer substantive-enough evidence to alter the course of monetary policy. Having now monitored the situation for reasonable period of time, the Fed will have an opportunity to express its views in hard numbers and explain its thinking. An upbeat set of economic forecasts that belies a firm commitment to continued stimulus reduction couched in similarly-themed rhetoric from the Fed Chair is likely to put the disparity between the direction of US and Australian monetary policy in stark relief. Whereas the RBA has opted for a “period of stability” over the foreseeable future, the FOMC has slowly but surely proceeded with moving from the dovish extreme of the policy spectrum into the opposite direction. That ought to put the Aussie under pressure as the currency’s perceived yield advantage against its US counterpart is eroded. However, it is also critical to be mindful of the Australian Dollar’s place on the risk-on side of the sentiment divide in the G10 FX space. This makes the currency highly vulnerable to sharp swings in risk appetite, warning of potentially treacherous terrain ahead as geopolitical headwinds gather. The crisis in the Ukraine takes top billing ahead of a referendum in Crimea set to be held this weekend. The poll will decide whether the semi-autonomous region will choose to be part of a nation headquartered in Kiev or Moscow. The referendum’s outcome and subsequent maneuvers from world powers has scope to generate significant knee-jerk volatility in investors’ mood. An upsetting of the status quo is often the risk-off scenario in the markets’ treatment of geopolitics, suggesting a vote to secede from the Ukraine and be absorbed into Russia may carry negative implications for the Aussie. Such an outcome is somewhat high on investors’ probability scale however, so the surrounding theatrics (including Moscow’s moves to scramble together the legislative framework to allow Crimea to join the Federation) will be important in gauging market-moving potential. The yen rose against the dollar and the euro on Friday as safe haven demand was bolstered by fears over an economic slowdown in China and tensions over the crisis in Ukraine, ahead of a referendum in Crimea. The euro zone is to release data on consumer price inflation, which accounts for the majority of overall inflation. Canada is to produce data on foreign investments. The U.S. is to publish data on manufacturing activity in the Empire State, as well as reports on industrial production and long term securities transactions. The Reserve Bank of Australia is to publish the minutes of its latest policy meeting, which contain valuable insights into economic conditions from the bank’s perspective. The ZEW Institute is to release its closely watched report on German economic sentiment, a leading indicator of economic health. Canada is to publish data on manufacturing sales. Later Tuesday, Bank of Canada Governor Steven Poloz is to speak, his comments will be closely watched. The U.S. is to produce data on consumer inflation, in addition to reports on building permits and housing starts. Bank of England Governor Mark Carney is to speak at an event in London. Japan is to publish data on the trade balance, the difference in value between imports and exports. Meanwhile, Bank of Japan Governor Haruhiko Kuroda is to speak at an event in Tokyo. The U.K. is to release official data on the change in the number of people unemployed and the unemployment rate, as well as data on average earnings and public sector borrowing. Meanwhile, the Bank of England is to publish the minutes of its most recent policy setting meeting. The ZEW Institute is to publish a report on economic expectations in Switzerland, a leading indicator of economic health. Canada is to release data on wholesale sales. The Federal Reserve is to announce its federal funds rate and publish economic forecasts for inflation and growth. The Fed statement is to be followed by a press conference with Chair Janet Yellen. Later Wednesday, New Zealand is to publish data on fourth quarter gross domestic product, the broadest indicator of economic activity and the leading indicator of economic growth. Germany is to release data on producer price inflation. BoJ Governor Haruhiko Kuroda is to speak at an event in Tokyo. The Swiss National Bank is to announce its libor rate. The bank is also to publish its quarterly monetary policy assessment. Political leaders and finance ministers from the EU are to hold the first day of an economic summit in Brussels. The U.K. is to release private sector data on industrial order expectations. The U.K. government is to make its annual budget statement. The U.S. is to publish the weekly report on initial jobless claims, as well as data on existing home sales and manufacturing activity in the Philadelphia region. Markets in Japan are to remain closed for a national holiday. The euro zone is to release data on the current account. Meanwhile, political leaders and finance ministers from the European Union are to hold the second day of an economic summit in Brussels. The U.K. is to produce data on public sector net borrowing. Canada is to produce official data on retail sales, the government measure of consumer spending, which accounts for the majority of overall economic activity, as well as data on consumer inflation. The yen ended the week at two-week highs against the dollar on Friday, as concerns over slowing growth in China and heightened tensions between the West and Russia over Ukraine underpinned safe haven demand. Japan is to publish data on the trade balance, the difference in value between imports and exports. Meanwhile, Bank of Japan Governor Haruhiko Kuroda is to speak at an event in Tokyo; his comments will be closely watched. The dollar ended the week close to two-and-a-half year lows against the traditional safe haven Swiss franc as a combination of fears over the crisis in Ukraine and a slowdown in China’s economy sapped risk appetite. The SNB is to announce its libor rate. The bank is also to publish its quarterly monetary policy assessment. The U.S. dollar moved higher against the Canadian dollar on Friday as investors shied away from risk sensitive currencies amid ongoing concerns over the crisis in Ukraine and slowing growth in China. Canada is to publish data on manufacturing sales. Later Tuesday, BoC Governor Steven Poloz is to speak, his comments will be closely watched. Canada is to round up the week with official data on retail sales, the government measure of consumer spending, which accounts for the majority of overall economic activity, as well as data on consumer inflation.